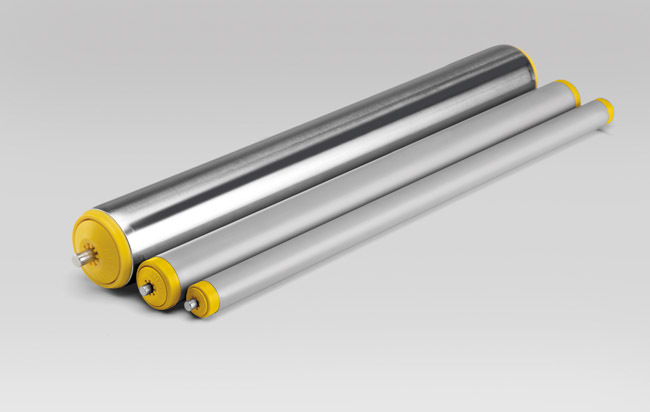 These rollers are obtained from an excellent combination of Polymers making them extremely light, smooth running, noiseless and consequently limiting gravity conveyors slopes even with light packages. The tube in RAL 7030 grey colour is obtained from special high impact and noise-absorbing PVC, extruded under strict tolerances. We can also foresee the version with zinc-plated tube or stainless steel AISI 304 tube. The end caps, yellow colour RAL 1023 or in the alternative colour on request, are made by a housing in Polypropylene, by an inner race in POM (acetalyc resin), with AISI 420C stainless steel balls. This grants them high performances. Furthermore, the particular shape of the end-caps makes a centrifugal labyrinth sealing. The standard spring loaded shaft makes the installation easy; on request the shaft is supplied in stainless steel AISI 304. These rollers have their ideal application in light units handling in corrosive and wet environments, and in the packaging food processing, especially when they have AISI 304 stainless steel tube and shaft execution. Allowable temperatures range from –5°C to +50° C for the PVC tube and –5°C to +80° C for steel tube; applications in lower temperatures must be verified according to the different working conditions.